Merlin and his Dragon “Smog”! Bruce Hunt (master Comedy Magician) without the Merlin outfit! 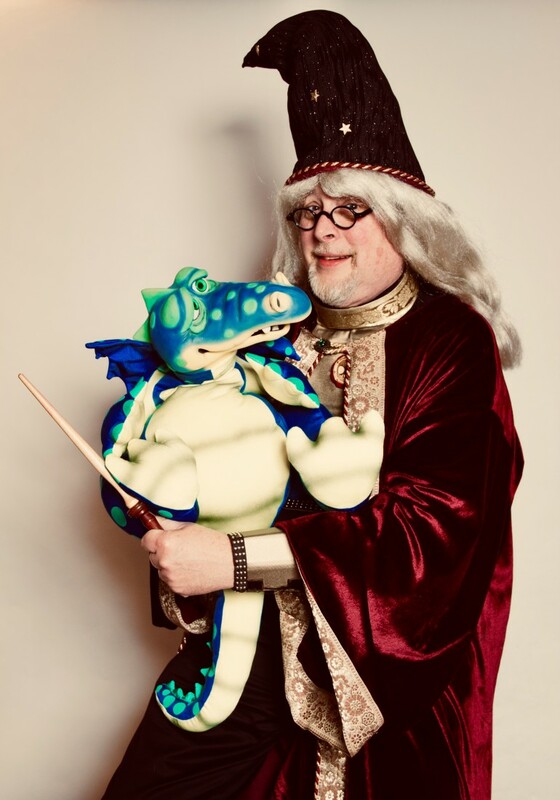 Merlin the Magician and his sidekick Smog (a wisecracking dragon) can’t wait to make your child’s birthday party a very special event that will have all of his/her friends talking for a long time! Community and Corporate events too! 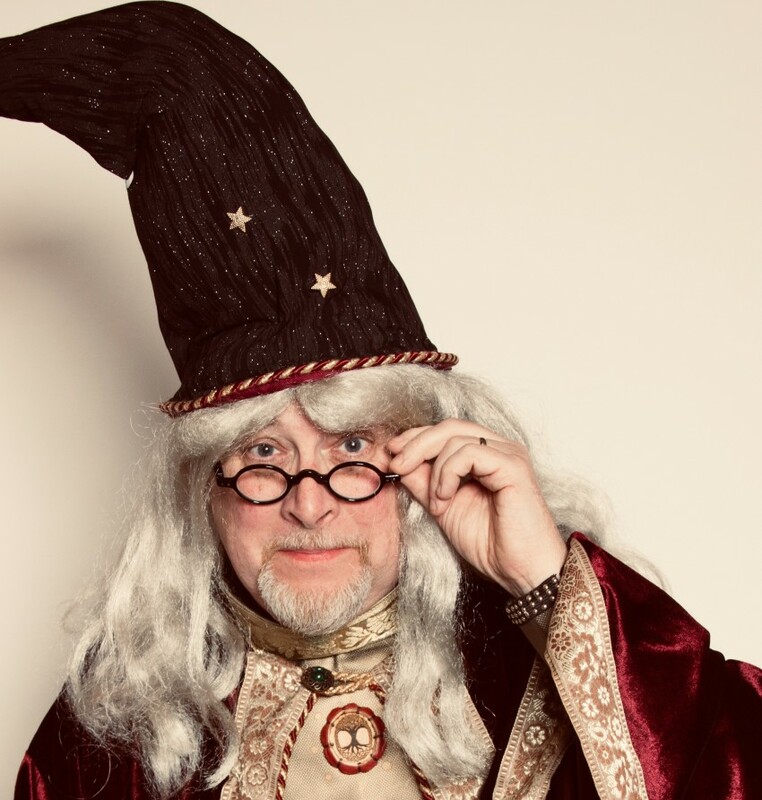 Merlin is an award winning comedy magician with thousands of shows under his belt. 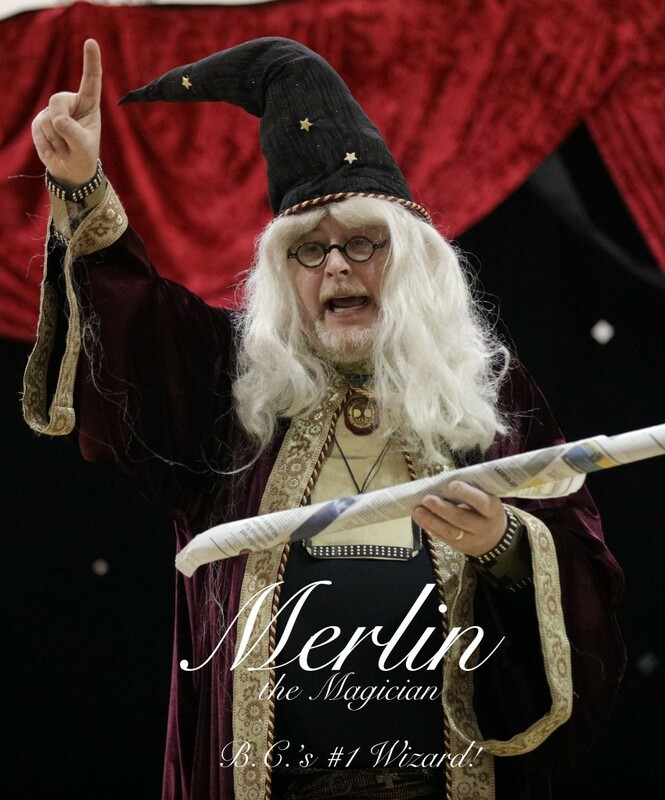 Make your event extra magical and create lasting memories with Merlin! Don’t want a costumed character? Adult or corporate events, Bruce Hunt (Merlin’s real name!) does stand up, stage or walk around magic that appeals to all ages! He can also promote your company logo or product! For the Christmas season, Mr. & Mrs. Claus can make appearances at company parties and home visits. Entertaining 17 and 18 year olds is never easy and can be a difficult task. Firstly Merlin arrived late after the majority of students had arrived. Perhaps arriving late put him off his game but knowing the age of his audience well in advance Merlin couldn't seem to capture their attention or connect with them, definitely falling flat! Originally the students seemed intent on watching the show but for only 5-10 minutes and then walked away. Disappointing. Thank you, Jessica! I had a great time entertaining everyone at the party and am so glad you enjoyed the show. That the children or audience will enjoy themselves immensely! It is not uncommon to hear very loud laughter and total pandemonium - all of course under control of a master magician! Prepare for excellent photo opportunities where your child will become the star of the show (but only if he/she wants to be) and maybe even magically float in mid air!! If it is a corporate event, the CEO of the company can join in the fun too! All in all, a great time for everybody with lots of laughter and fun! Born and raised in Vancouver B.C., Canada, Bruce Hunt (Merlin’s real name!) currently resides in Surrey B.C. - just outside Vancouver. 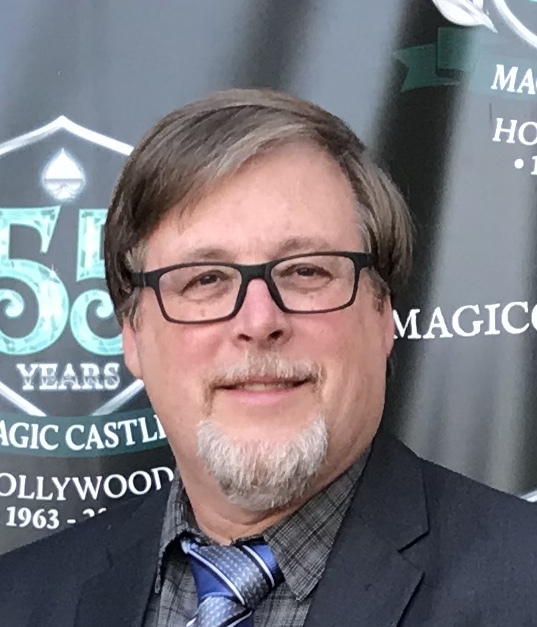 Bruce started performing magic on stage at the age of 9 in the mid 1960’s and has performed thousands of shows since that time for private parties, community events, corporate events, and small and large stage shows. He has won numerous awards as a Children’s performer, Comedy magician, and magic inventor. 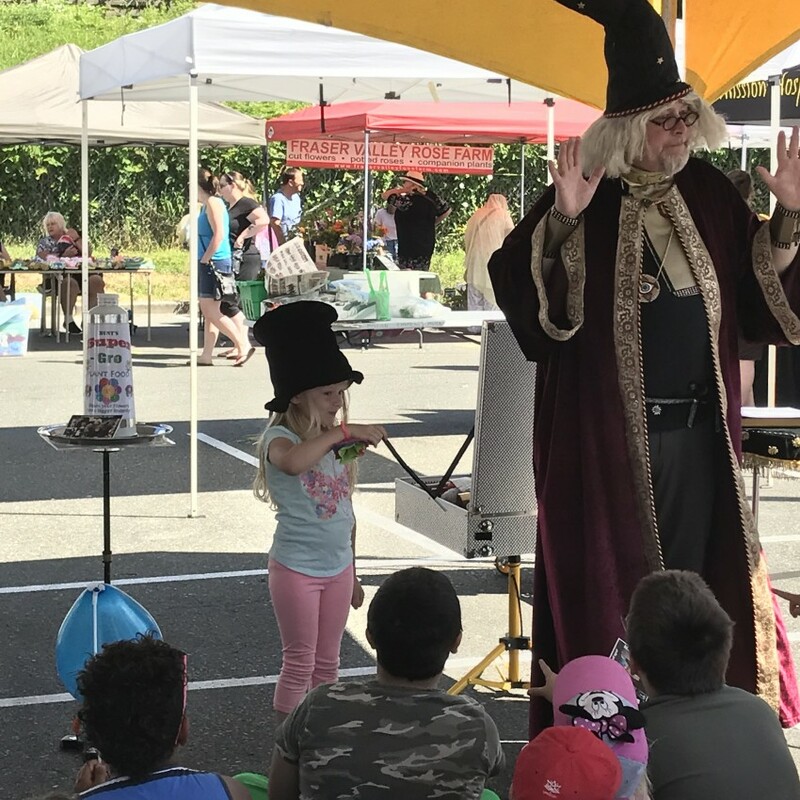 In the last several years he has taught magic in schools, supplied magic props for the movie industry, performed in night clubs and many venues abroad. Currently Bruce is focusing on the Children’s Birthday market (after all, every child has a birthday!) with his character “Merlin the Magician” and puppet dragon sidekick “Smog”, but still does out-of-character shows, all with a comedic bent. Magic is the only thing Bruce does now to earn a living, so he is available any day of the week - but remember to book early as the bookings are first come, first served! In home parties - there is no special requirement. I have a portable backdrop if needed and a small P.A. System with music. For large stage, a sound system and lighting may be required.